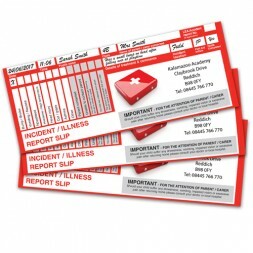 This incident recording system enables organisations to provide pupils with an incident record which highlights what they were treated for, how and by whom. Personalise this product with your own school logo. This incident record system enables education establishments to provide pupils with an incident record which highlights what they were treated for, how and by whom. This streamlines processes and ensures incidents are monitored effectively. A master record and incident report are created simultaneously, eliminating the need to create an additional letter to send to parents. Passes are full colour and personalised as standard. Comes in sheets of 10 (overlapped passes), minimum order quantity of 500 passes. Our orders are delivered by dedicated courier and will require a signature on delivery. If your order was damaged, has missing items or contains products which you did not order, please contact us at customerservices@kalamazoodirect.co.uk for further assistance. Items can be returned and refunded, minus a handling fee, if they are in good condition, have not been used, and are not opened. A return delivery charge will apply unless the return is due to damage or a mistake by Kalamazoo Direct. Credit Notes will be processed on your return once the goods have been received by us; until they are received by Kalamazoo Direct they remain your property. We highly recommend using a ‘signed for’ return delivery service such as Royal Mail Recorded Delivery. Imprinted and special or made-to-order items will not be accepted for return under any circumstances. For further information please visit our Delivery and Returns Policy. We have been supplying organisations internationally for over 100 years. Our quality, integrity and customer service is well known throughout the industry and we have thousands of loyal customers. We specialise in products and solutions that protect documents, assets and identities from fraud and replication. Our solutions help our customers to apply best practice and fulfil their responsibilities for security, health and safety and corporate image. Our dedicated team are always available to help and advise you on any of our products, so please feel free to contact us any time at info@kalamazoodirect.co.uk. ® 2018 Adare SEC Limited trading as Kalamazoo Direct.